There is just something magical about working in the garden. The the sun shining down on your face and breathing in the fresh air will do work wonders for your soul. However, many gardeners will say it is the feeling working the soil with their hands that keeps them coming back for more. 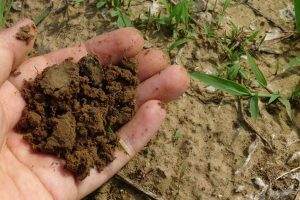 If your soil isn’t exactly the smooth, soft and healthy soil of your dreams, do not worry there are easy ways to remedy that. Composting is one of those easy ways to get your soil feeling the way you’d like it to. If you haven’t composted before you may be wondering if you can use your grass clippings in your compost. The answer is a resounding YES! This article will go over all you need to know about the basics of composting, and how to successfully add grass clippings to your compost. Many people who are new to composting will confuse composting with fertilizing. Compost is not a fertilizer. Fertilizers are often chemical in nature, while composting is made of organic materials. A compost is a collection of organic materials that break down to enrich your soil with essential nutrients. There are many benefits to making your own compost to add to your garden soil. Adding a compost to your soil will strengthen the structure of your soil and help create a smooth texture. It can also increase airflow and water retention in your gardens. Compost will also even out PH levels in the soil and encourage healthy bacterial growth. All of these benefits from compost will lead to healthier plants as well. Because composting is a natural process it takes times. Plan on at least 2-3 months of composting before your first “batch” is ready to add to your garden. Grass clippings are a beneficial addition to any compost pile. They are readily available to most gardeners, and replenish frequently. This makes grass clippings an easy go to when you are trying to add bulk to your compost. They are also a healthy and helpful addition to composting because they are rich in nitrogen. Microbes use that nitrogen to break down and decompose other organic materials in the compost. However in addition to being rich in nitrogen they are also full of water. This can help decompose and breakdown other organic materials, but needs to be done carefully. If you are not careful about how you add your grass clippings to your compost you may end up with a big stinky pile of wet grass! You may be tempted to just dump great big bags of clippings on top of your compost pile. Try and resist that urge. Grass clippings are considered “green” or “wet” material and need to be balanced out with “brown” or “dry” materials. Some brown items that you could mix in with your grass clippings include dried leaves, wood chips, or even straw. Without the addition of brown materials the grass could become so heavy and dense that it does not allow air to circulate through. This will slow down your composting process. If you do not have any brown material to mix with your grass, you can still use your grass clippings. All you need to do is spread out the grass clippings and let them dry completely before adding them to the compost. This rids your clippings of extra moisture and makes them a “brown” material. Because most gardeners have an abundance of grass clippings to add, it can be easy to let them takeover your compost pile. Even if they are balanced out with brown material, too much fresh grass will drastically slow down your compost. To remedy this problem, consider having multiple compost piles in different stages of breaking down material. When it comes time to add grass clippings to your compost, simply move the grass that has already begun breaking down to a compost pile that is also in the same breaking down stage. You can continue to rotate and move your grass clippings until the compost pile is ready to mix with your soil. In addition to moving around the grass clippings, you should also be mixing or flipping your compost piles to help incorporate air. This should be done with a shovel on a monthly basis. It is not always beneficial to add grass clippings to your compost. If your grass is excessively wet it will slow down the composting process and create a giant stinky pile of grass instead. So if you mow your lawn after a rainstorm you may want to consider bagging your grass clippings to toss away. You could always spread them out and let them dry for a few days before adding them if that is what you prefer. Another reason you would want to avoid adding your grass clippings to your compost is after you spray herbicides. Herbicides are full of harmful chemicals that you do not want in the compost or garden soil. Consider tossing out the grass clippings for a full two weeks after any pesticides or herbicides are sprayed. If you don’t want to throw your clippings away consider grasscycling. Many experts prefer grasscycling to adding grass clippings to their composts. Grasscycling occurs when you mow your lawn frequently and at the correct height. When you are mowing your lawn as recommended you don’t have large blades of grass that need to be cut. Instead you have only a tiny bit of the grass needs to be cut each time. When grasscycling do not mow your lawn with a grass catcher attachment. Just simply allow the small pieces of grass to fall back onto your lawn. These tiny pieces of grass will begin to breakdown after just a few days, just like they do in your compost pile. As they decompose they release the excess water and built up nitrogen into your lawn. This practice naturally adds nutrients to your lawn and decreases the need for fertilizers and herbicides. Leaving you with a full and healthy lawn. Composting is a great way to recycle your grass clippings. It will not only benefit your garden soil, but it also avoids putting large bags of grass into our landfills. Even if you do not compost your clippings after each time you mow, just adding them to your compost once or twice a month is helpful. Remember to either add brown material with your clippings, or to let your grass clippings completely dry before mixing them in your compost. Otherwise you could end up with a big, stinky, and slimy heap of grass. Hopefully you learned enough that you will feel confident adding your grass clippings to your backyard compost pile this summer!